Earlier in the year I made this mixed media picture combining photo transfer, collage elements, modeling paste and acrylic paint. I was inspired by my favorite band, Cold Play and their song "Paradise". I started by photo transferring this striking image of a woman onto a canvas board and then built the rest of the collage around her. 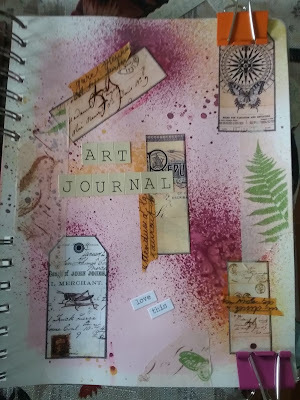 I used images from a sheet of Prima scrapbook paper from their Engraver collection which were distressed by rough cutting the edges and rubbed with Distressed Ink. Pieces of stamped sewing pattern tissue paper were collaged onto the board and then a wash of Titan Buff and light sky blue acrylic paint was added to soften and blur the edges. Textured flourishes were made by pushing modeling paste through a stencil. They were then highlighted with black and sky blue paint. A crown for the woman and an antique earing for her exposed ear were added along with a quote from the song that inspired the piece. but it flew away from her reach, so she ran away in her sleep"
To finish, I stamped the words "she dreamed of paradise" across the top. As a way to hang the piece, I ran a piece of driftwood through two curtain rings I got at the local hardware store.